No matter what field you belong to, if you are not keeping your level up, if you are not getting yourself updated and if you are not trying something new, chances are that you won’t get the best out of it. Because with the passage of time, things change and evolve for the better so it is very important to move with time. Things that are being tested before should not be dependent upon in the current situation because novelty is demanded and appreciated too therefore it is cardinal and pertinent to go ahead with the requirements of time and pursuits. Imagine yourself wearing leafs and petals as man used to wear in the Stone-age, would you be able to survive in this tech and fast pace world like that? No! Therefore, the one who moves on with the current hassles of time becomes successful. Artists have to be very much charged both mentally and physically to perform well and outdo themselves on the workplace. Too much is expected from them and too much they have in their plates, they cannot put off till tomorrow what they can do today. 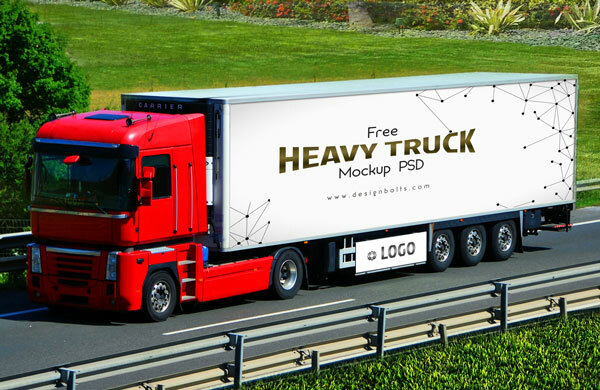 My post of today is dedicated to all those designers who are wanting to have branding mockup, here I have made a free vehicle branding heavy duty truck mock-up for your ease. I am sure it is going to do a great deal to all of you, in a way of presentation. You can paste your own design element into this truck branding mockup as per the demand of your client. This is very useful if someone wants to make the brand advertisement this way. The truck will move in the towns and cities & people will notice what is embarked on it. Such a communicative business tactic it is. Also a giant size truck is the best vehicle to put forward your brand emblem and stance. Do write to us about your wish list so we will do the best to accumulate the kind of posts you all are eyeballing at. Have a look down here at the mockup PSD and use it in your upcoming projects!